It’s almost that time: that fall day in Lincoln Square where the smell of fresh baked Apple Pie wafts out of The Chopping Block’s kitchen, where hot mugs of Apple Cider are consumed all day, where bushels of apples are displayed, where kids have sticky faces from caramel apples, and where families are strolling along Lincoln Avenue taking it all in. Apple Fest is near! The annual celebration of the arrival of fall is one of Chicago’s best festivals. It offers live music, food featuring seasonal apples made into everything from pizza to pie, great local shopping and children’s activities all day. 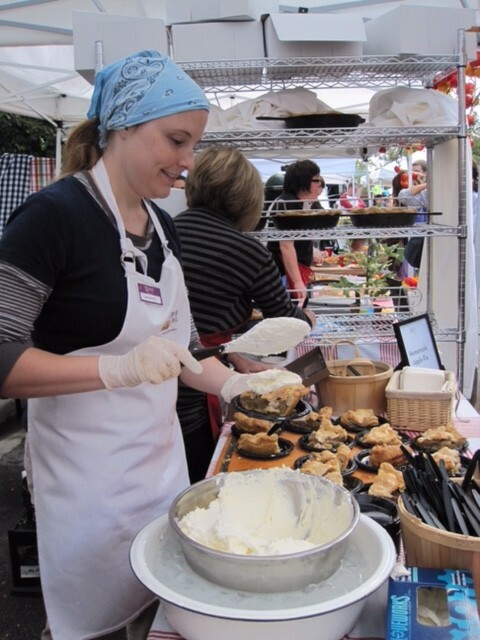 As always, The Chopping Block will be serving up our Famous Apple Pie. Did you know that it was one of the dishes featured in our very first cooking class when we opened our doors 18 years ago? A lot has changed over the years, but not this recipe. 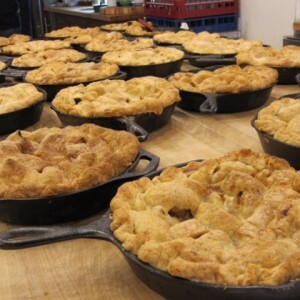 The Chopping Block’s Owner/Chef Shelley Young shares the history of our apple pie and of course, her famous recipe. Get more fun facts about apples from the New York Apple Association. There’s even a National Apple Museum (http://www.nationalapplemuseum.com/index.html) in Biglerville, Pennsylvania which aims to preserve and exhibit the history and artifacts pertaining to the apple. Have you heard Chicago’s first museum dedicated to food just opened? Foodseum is a pop-up museum dedicated to culinary traditions in the Loop. Being as it’s based in Chicago, the first exhibit is all about sausage. Admission is free, so be sure to stop by before the exhibit closes in December. You’ll see a video of Shelley and Chef Mario Scordato showing you how to make and cook with encased meats. See you at Apple Fest!